Pakistani Asia Bibi has been acquitted of a death sentence for blasphemy charges, but the Christian woman who has spent eight years in prison is not yet out of harm’s way. Islamic protesters have blocked a key road in Pakistan and are calling for Bibi’s public hanging, despite the court ruling. Prime Minister Imran Khan warned Islamic protesters not to “test the patience of the state.” According to the Catholic Herald, militant Muslims have offered 500,000 rupees (almost $4,000) for Bibi’s murder. Despite the verdict on Wednesday, October 31, freeing her, Bibi is still being held in an undisclosed location for security reasons. As soon as it is safe to do so, Bibi and her family plan to leave Pakistan, according to her brother. “She has no other option and she will leave the country soon,” Bibi’s brother said. He did not mention the country Bibi and her family will relocate to. Although, as the Hindu reports, France and Spain have both offered Bibi asylum. Bibi’s husband, Ashiq Masih, and one of the couple’s daughters traveled to Great Britain this summer. More than 1,000 Islamic extremists blocked the road linking the capital Islamabad with the city of Rawalpindi on Thursday, November 1, 2018. Paramilitary troops have been deployed, but the road remains blocked for a third day now. The protesters, many of whom belong to a hardline Islamist group called the Tehreek-e-Labaik (TLP), are also burning tires. 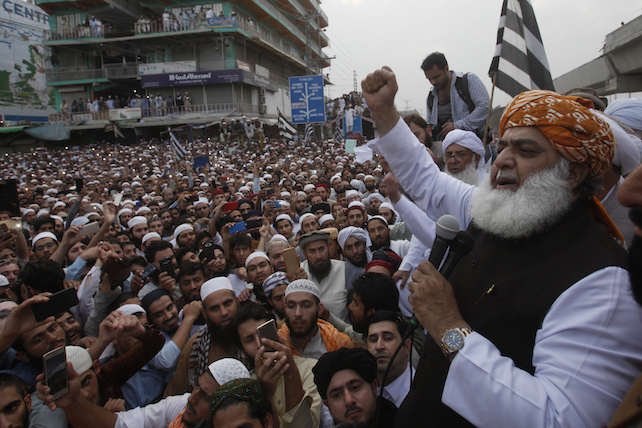 Pakistani authorities attempted to negotiate with the leader of TLP on Thursday, but they did not reach an agreement, according to Hindustan Times. The protests have only spread and intensified since Wednesday when the Supreme Court decision announcing the overturning of Bibi’s death sentence was made public. On Friday, the government shut down phone networks in the major cities of Islamabad and Lahore and several schools were closed due to the protests. Bibi isn’t the only one whose life is in danger due to the ruling. Some who supported her during her years-long imprisonment have even been killed. Salmaan Taseer, the governor of Punjab, was assassinated after saying he would fight for her acquittal and release. Additionally, Minority Affairs Minister Shahbaz Bhatti, a Christian himself, was murdered after he indicated he would work to reform the blasphemy laws. Now, Bibi’s lawyer, Saiful Malook, has gone into hiding. There are also threats being levied against the Pakistani Supreme Court judges who ruled in Bibi’s favor. Additionally, Bibi’s husband and five children are currently hiding. It is not known when Bibi will be able to join her family again. Opposition lawmakers in Pakistan’s Parliament are calling for a reformation to the country’s judicial system. The call includes changing the blasphemy law to avoid incidents like Bibi’s, where an innocent person spent years in jail for no reason. In the majority Muslim nation of Pakistan, the law has been used in the past to justify lynchings and is often hung over Christians’ heads to intimidate them.